Switzerland. In German: Schweiz, in French: Suisse, in Italian: Svizzera and in Romansh: Svizra. These are the four native languages spoken, depending on the geographical area. Officially the name is Swiss Confederation, in Latin: Confoederatio Helvetica, hence its abbreviation CH. A land locked country in the European Alps, 15,950 sq mi and with a population of 8 million, it borders Germany to the north, France to the west, Italy to the south and Austria & Lichtenstein to the east. The oldest traces of hominid existence in Switzerland date back about 150,000 years and the oldest known farming settlements have been dated to around 5300 BC. Augusta Raurica was the first Roman settlement on the Rhine river, founded in 44 BC. It is now among the most important archaeological sites in Switzerland. 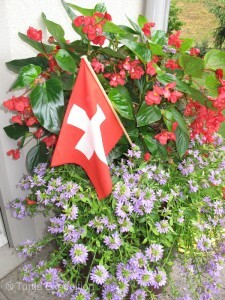 The Old Swiss Confederacy was an alliance among the valley communities of the central Alps. The Confederacy facilitated management of common interests and ensured peace on the important mountain trade routes including the Gotthard Pass. The Federal Charter of 1291 agreed between the rural communes of Uri, Schwyz, and Unterwalden (around Lake Lucerne) is considered the confederacy’s founding document, even though similar alliances are likely to have existed decades earlier. 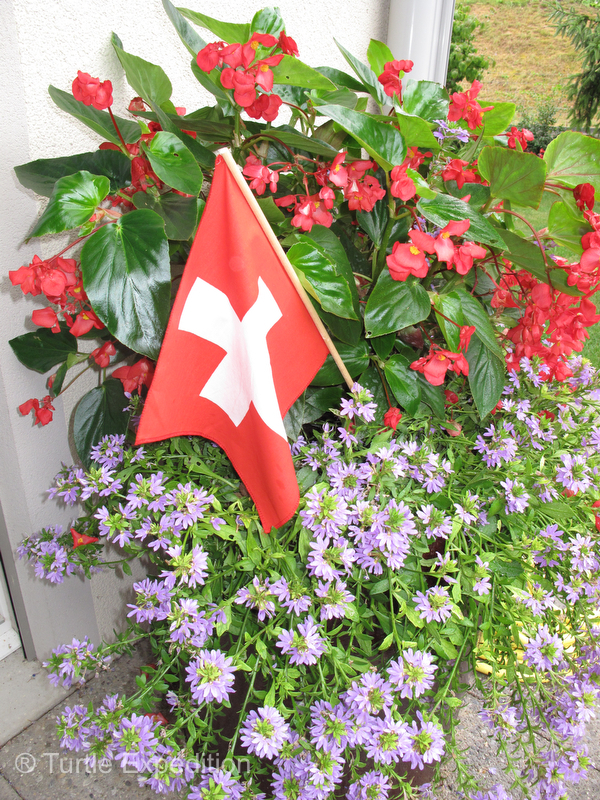 The document was signed “the beginning of August, 1291”, and now it is August 1 that Switzerland celebrates its Independence Day. 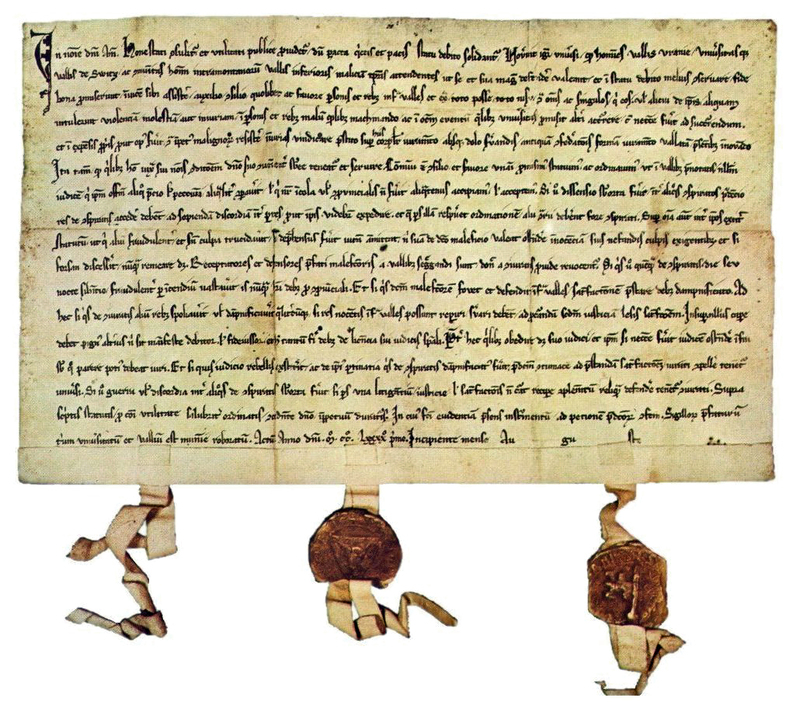 The “Bundesbrief” dated “the beginning of August 1291”, is considered Switzerland’s founding document. 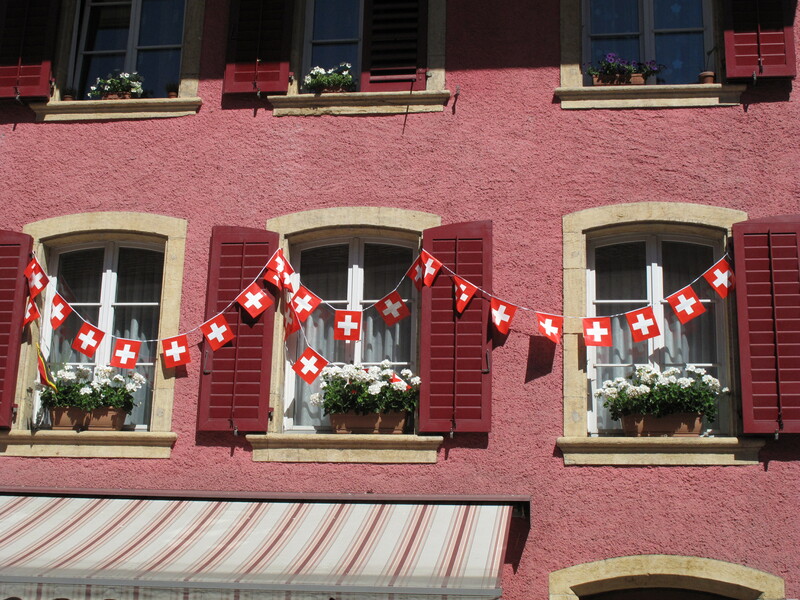 All communities are decorated with Swiss flags and most homes will display little flags & lanterns and red candle lit cups on the window sills. 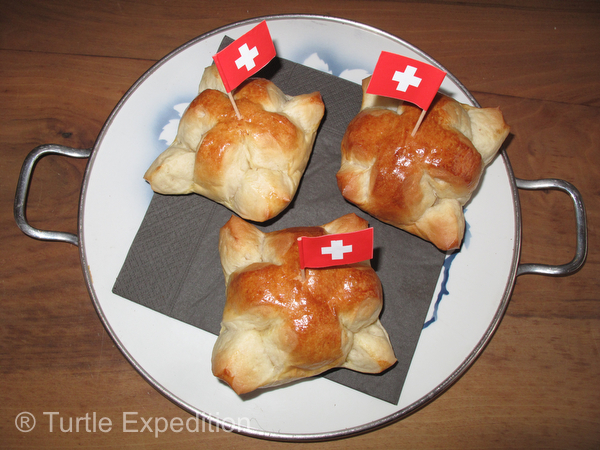 Bakeries sell special August 1 breads decorated with mini Swiss flags. August 1, 2013: Every village, town or city has their own, though similar, local tradition. Wiesendanger folks gather on the school’s recreation area (or in the gym if it rains). In the evening, the two churches ring for 15 min. with all their bells in festive union. There is a speech by the major or another prominent person, gymnastic clubs perform and local choirs sing. Brass bands or accordions play folk music. The National Hymn is sung. Bratwurst or Cervelat (the national sausage) served with mustard and a slice of bread are eaten. Of course, there is always beer and wine…. After dark, the children light their lampions (lanterns) which they carry proudly on a short stick. Fireworks entertain the crowd and at the end, everyone wanders up to the huge bond fire on the hill. These “Augustfeuer” (August fires) have a special spot in every Swiss’ heart. Most likely, an ancient tradition. It is particularly spectacular in the mountains where you can see many Augustfeuer on mountain tops and hills all up and down the valleys. Bakeries sell August 1 bread decorated with tiny Swiss flags. 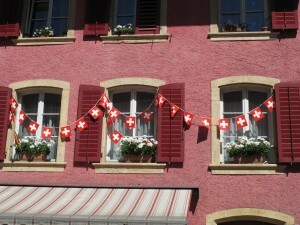 Every house is decorated with Swiss flags and red candle lit cups.